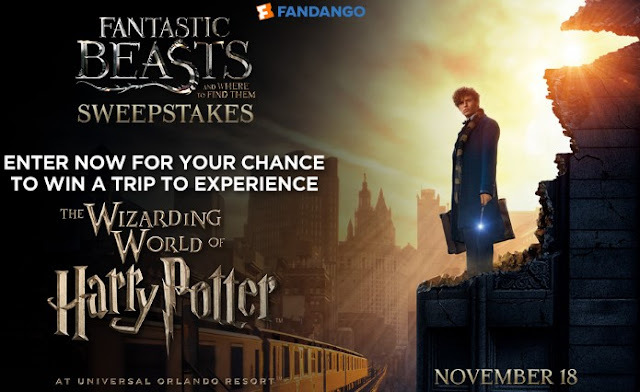 Fandango is giving you a chance to win a free trip for four to Orlando to visit the Wizarding World of Harry Potter, a prize worth nearly $5000! The Grand Prize shall consist of a three (3) night / (4) day trip to The Wizarding World of Harry Potter at Universal Orlando Resort in Orlando, Florida for Winner and up to three (3) guests (each a, “Guest”) (hereinafter the “Trip”). The Trip includes: (i) round trip economy airfare for Winner and Guest(s) on the airline of Sponsor’s choice from a major airport near Winner’s home and in Sponsor’s sole discretion, to a major airport in or near Orlando, Florida (approximate retail value (“ARV”) of airfare tickets: $2,800); (ii) three (3) nights standard hotel accommodations (quadruple occupancy) (“Hotel”) in or near Orlando (ARV of Hotel for four (4) nights: $1,000); (iii) a two (2)-day Park-to-Park admission ticket for Winner and for each Guest to Universal Orlando Theme Park (ARV: $750); [l2] and (iv) limited travel insurance for Winner and Guests (ARV: $300). The total ARV of the Grand Prize is four thousand eight hundred fifty dollars ($4,850). HINT: You can actually get up to TEN entries. See the rules for details. This Sweepstakes ends on 11/21/16 and you can ENTER ONCE to win.